This month, we are working on Block 3 (page 29 in the Quilter’s Planner Magazine). Block 3 uses colored and background squares and rectangles to create a checkered design. For our Block 3, we used the following feature fabrics by Alison Glass for Andover: Kraken in Urchin from Diving Board and Depths in Honey from Sun Print 2018. 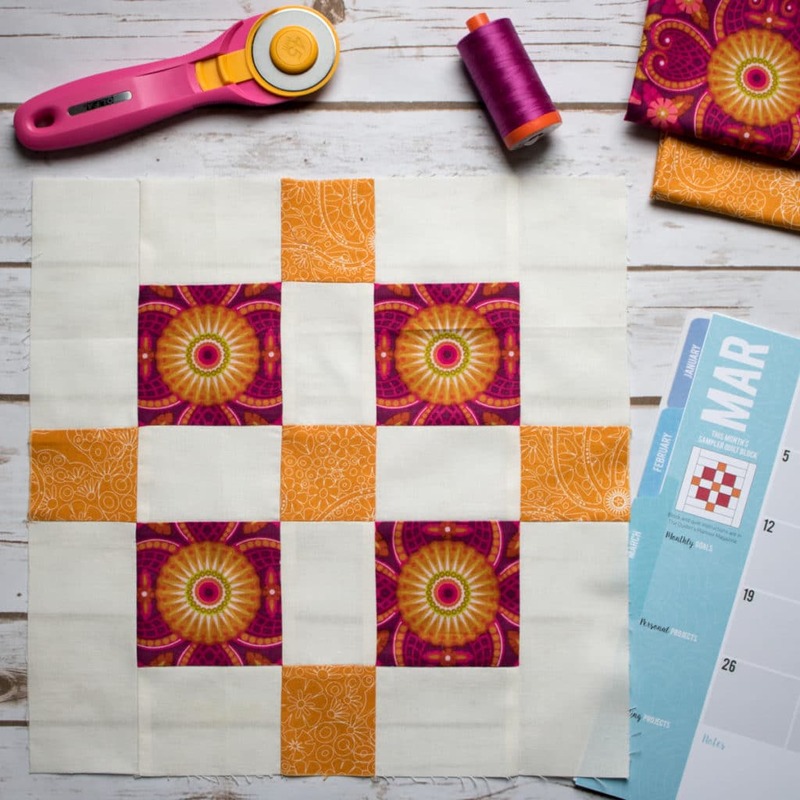 We’re back to basics with this straightforward block comprised of sewing squares and rectangles together, so this is a great opportunity to focus on accurate cutting and sewing using the scant ¼” seam allowance. It really locks your seams. If you’ve ever seen the the last stitch or two on the edge of your block start to separate (especially if it was chain pieced), edge stitching will hold those seams together. It also helps to hold your seam allowances in place. If you’re ever had a seam allowance flip over when you’re sewing, you’ll probably know exactly what I’m talking about. It will stop the fraying at the edges. I’m sure we have all seen the edge of a cut piece of woven fabric where the it looks like a thread or two has come off. It happens even on extremely high quality and densely woven fabrics, especially if it’s something that gets handled regularly. When I have a project, especially something like a Block of the Month, I like to be able to pull out all of my blocks and look at them together which means more picking them up and moving them around. Even if you are gentle with your handling, the fabric still shifts and more bits of thread are prone to unraveling. This is also especially handy if you have a block with a bias edge because the stitching will keep the fabric from stretching along the edge. As a side note, this works great on quilt tops too. If you’ve chosen to follow the Modern Bliss layout, there is only 1 version of Block 3 in the quilt pictured on the cover of the magazine (the middle block on row 6). Also, don’t forget that the Modern Bliss layout uses blocks set on point (rotated 45 degrees), so that may be something to consider when selecting fabrics. After you cut your pieces some of the piece dimensions are similar, so label your cut pieces with sticky notes, and check to make sure that they are oriented properly when you sew your pieces together! If you’re sewing along with us and entering your blocks on Facebook or Instagram to be eligible to win our monthly prize, here is a reminder for the guidelines. Between the 15th and the end of the month, sew up your block and post it to Instagram (please tag @thequiltersplanner and use the #QP2018sewalong hashtag) and/or to the Facebook Group (using the same #QP2018sewalong hashtag). We will have prizes for both, but you are only eligible to win the monthly prize once. 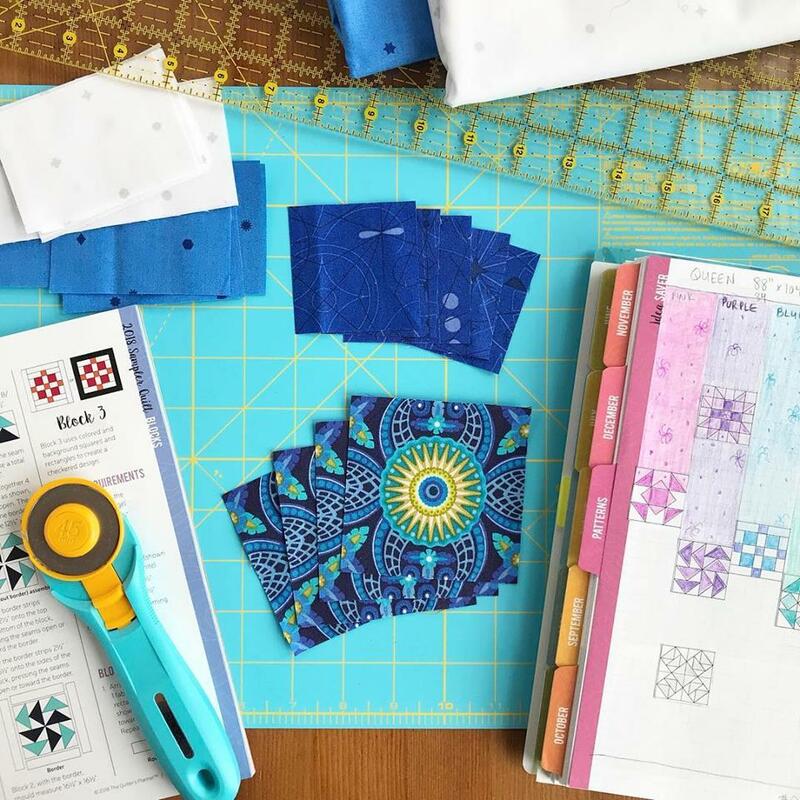 When you post a photo of your block on Instagram or in our Facebook group by each deadline set for the month (usually the first of the next month), you’ll be entered into a drawing for some great prizes from our sponsors: Andover Fabrics, Aurifil, OLFA, and the Quilter’s Planner. Each month’s entry must be posted by 12:01 am Central Time to be eligible. You MUST tag @thequiltersplanner on IG or post your block in our Facebook group with your entry and use the hashtag #QP2018sewalong (please be sure to use the hashtag on Instagram AND Facebook) so we can track your entry. If you win one month’s prize, you will be eligible to win again at 6 months and 12 months, if you complete and enter each month’s block on time.